Dogs have always been our passion, which was constantly growing over the years. In 1993 this passion gave rise to a Shih-Tzu kennel called "Acte". In 2005 it was registered in FCI, and since then it is known as Ad Acte. Each and every puppy is surrounded with loving care and provided with great living comfort along our family members. We exhibit our dogs actively in countries all around Europe. From their earliest years they gain great recognition, which results in many prestigious junior championship titles. Most recent of their achievements are: Junior Champion of Europe title by Merlin Acte and Lady in Red Ad Acte, as well as Junior World Winner title by Pralinka Ad Acte on World dog show in Salzburg (2012r). Pralinka Ad Acte wasn't our only title winner at this show, Rewolta Ad Acte and Poker Ad Acte also found themselves on the Junnior class podium, each taking up 3rd place. 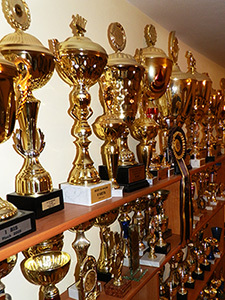 Our kennel's other unquestionable successes include variety of trophies and titles won by our dogs such as: Interchampionships, Championships of the following countries: Poland, Latvia, Russia, Estonia, Belarus, Ukraine, Slovakia, The Czech Republic, Hungary, Austria and Germany. If You are looking for a classy dog, then feel free to contact us to receive more information. Find out more about Ad Acte kennel.